Star-studded movie about the famous artist! Celebrated photographer and art impresario Alfred Steiglitz (Jeremy Irons) is shocked to learn that the extraordinary drawings he has recently discovered were rendered by a woman. 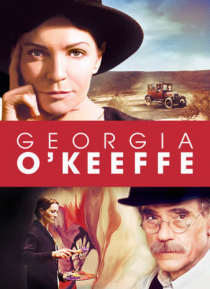 Deciding to display the work of then-unknown artist Georgia O'Keeffe (Joan Allen) in his gallery without her knowledge, the fiercely private artist orders him to remove the col… lection. Once Alfred convinces her to allow him to become her benefactor and to champion her artistry, their relationship evolves as they fall deeply in love. Alfred leaves his wife for Georgia, but soon finds her rising star is poised to eclipse his light. As their relationship suffers, Alfred finds twisted ways to emotionally wound her, including taking a younger lover. Georgia's search for solace moves her west, where she finds new inspiration for her paintings - and ultimately her own voice - in the New Mexico landscape.